So what's all the fuss about ? What are essential oils and why is everyone raving about them? In a nutshell, essential oils are nature's defence mechanism for plants and cells. My 6yr old likens them to some 'ninja warrior powers' that both attract the 'good guys' and fight off the 'bad guys'. It kind of makes sense! Essential oils are naturally occurring, volatile aromatic compounds that are found in the seeds, bark, stems, roots, flowers and other parts of plants. Not only do essential oils give plants their distinctive smell but they also protect plants and play a role in plant pollination. In a nutshell, not all oils are created equally. There are a number of reasons why I have chosen doTERRA's brand of essential oils which you can read about below. I love that Eucalyptus, Melaleuca (Tea Tree), Litsea and Lemon Myrtle are all grown by our local Aussie farmers. 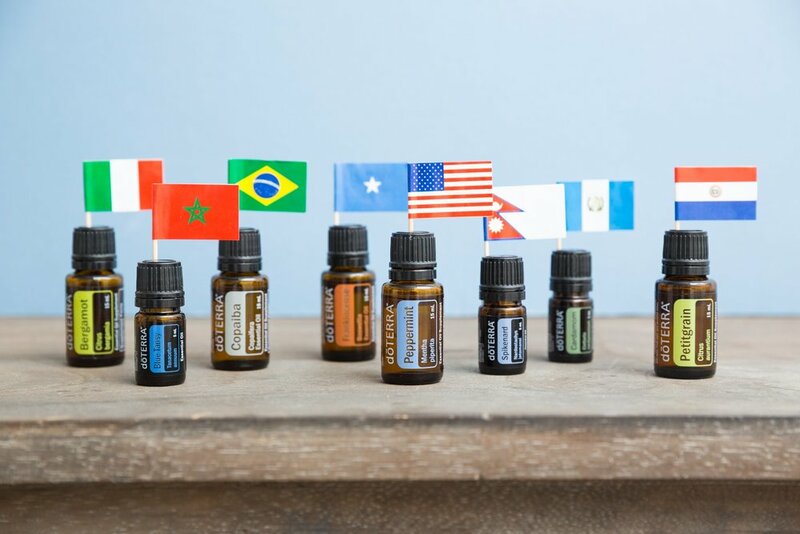 I love knowing that every time I use dōTERRA’s essential oils, I am not only helping myself and my family but there is also a ricochet effect happening around the world supporting the farmers, producers and distillers and many community projects. I also love that I am supporting the small but thriving business that my friend has created to support herself and her family by sharing these beautiful oils. Our sense of smell (olfactory) can elicit powerful physiologic, mental and emotional responses. Without realising it when we come across a certain smell we can be taken back to a certain memory, for me the smell of the 'On Guard' blend reminds me of Christmas and mulled wine on a cold winters night in Europe. Diffusing oils is one of the simplest ways to get the benefits of these oils. We diffuse calming and relaxing blends such as Lavender, Lavender Peace and Bergamot towards the end of the day to create a restful sleeping environment. In the morning, we tend to go for more uplifting and energising oils such as Citrus Bliss and Lemon and blend with Peppermint to bring focus and clarity to the day. Aside from the emotional properties, diffusing oils can also help purify the air of smells and airborne pathogens which is particularly handy if bouts of sickness are doing the rounds. My daily habit is to leave the Lumo diffuser running on intermittent for 10 hours during the day so that when we come home the house smells amazing and I know it will turn itself off when it runs out of water or the timer finishes. Essential oils are fat soluble so they are easily absorbed by the skin and can be safely applied topically. Applying essential oils in this way can have an immediate effect on the targeted area of application. The ‘reach’ of the targeted area can also be increased by diluting essential oils with a carrier oil (such as Fractionated Coconut Oil) to the target area of the application. For example, if my son has tummy ache I will add 1 drop Digestzen to 1 teaspoon of carrier oil and rub it on his tummy in a clockwise direction. If hubby has a sports injury he will add 3-6 drops per teaspoon of carrier oil. The appropriate dosage for topical use of essential oils is different for each individual and should be tailored to their personal circumstances. Dilution does not necessarily result in a less powerful therapeutic response, rather it slows the absorption process down and as essential oils are volatile compounds reduced how much evaporates. The doTERRA Touch range of rollerballs make life very simple as these have been prediluted as safe to use for everyone including children and the elderly. You can also make you own once you have the bottles of oil. Now this isn't for everyone. There is a lot of debate about whether essential oils should be ingested so my recommendations is to do your own research and follow what feels right for you and your family. Most of us agree that there is a lot of benefit ingesting plants and herbs for flavouring and therapeutic value. That being said, essential oils are potent, 1 drop of peppermint oil equates to 28 cups of peppermint tea so dosage is a key component when deciding. My personal choice is to take 1 drop of Copaiba and 1 drop Frankincense under my tongue daily as when I do this I feel less anxious and more centred. Its not for everyone though and thats ok too, there are still huge benefits using oils topically and aromatically.